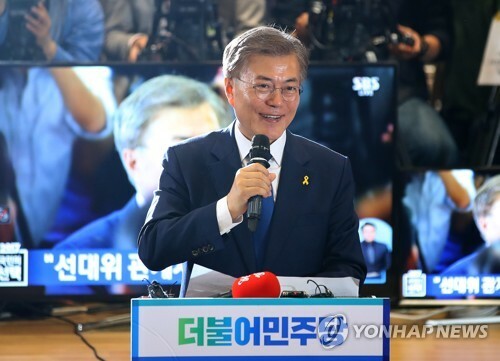 SEOUL, May 9 (Yonhap) — Moon Jae-in of the liberal Democratic Party was believed to have won South Korea’s presidential election held Tuesday with an exit poll placing him in the lead with an apparently irreversible gap over his rivals. Moon was estimated to have garnered 41.4 percent of all votes, according to the exit poll conducted by three major local broadcasters — MBC, KBS and SBS. The front-runner was followed by Hong Joon-pyo of the conservative Liberty Korea Party with 23.3 percent. The outcome of the exit poll was announced as the one-day voting came to an end at 8 p.m. Apparently seeing no possibility of the actual outcome of the vote being any different from the exit poll, Moon said his election, if confirmed, would mark the people’s and the party’s victory. “It will mark the victory of the people’s desperate wish for a government change. We did our utmost to help realize this aspiration of the people, and I believe that was the driving force that enabled our victory today,” Moon told his supporters and party officials at the party’s Seoul headquarters. Hong hinted at his acceptance of defeat, suggesting that his winning more than 20 percent of all votes in the election would mark success in its own way. “If the outcome of the exit poll is true, I will be happy to have rebuilt the party that had collapsed,” he told reporters. The former ruling party, previously called the Saenuri Party, was split in two after the defection late last year of 33 lawmakers who backed the parliamentary impeachment of then-President Park Geun-hye over a corruption scandal. They later created the Bareun Party in January. Park was removed from office on March 10 by a Constitutional Court ruling that upheld the parliamentary impeachment, setting the stage for the rare presidential by-election held Tuesday. The election had been viewed to be tilted in favor of liberal candidates as it followed the corruption scandal that led to her arrest and indictment. Ahn Cheol-soo of the center-left People’s Party was expected to finish third, with the exit poll showing him winning 21.8 percent of all votes cast in the election. The software billionaire-turned-politician acknowledged his defeat. “I humbly accept the people’s choice. I hope for the Republic of Korea to move forward into the future,” he told a press conference, referring to his country by its official name. Yoo Seong-min of the splinter conservative Bareun Party came in a distant fourth with 7.1 percent, followed by Sim Sang-jeung of the progressive Justice Party with 5.9 percent, the exit poll showed. As of 10:45 p.m., Moon had 38 percent of some 4 million votes counted so far, while Hong trailed with 28.2 percent and Ahn 21.2 percent, according to the National Election Commission. Because the latest presidential election was to fill the country’s now vacant top executive office, the successful candidate’s single five-year term will begin immediately after confirmation of the election result by the NEC. The NEC earlier said counting all the votes may take up to 10 hours, but that the winner could emerge as early as around midnight. The election watchdog said 77.2 percent of all eligible voters cast their ballots in Tuesday’s election. It marked the highest voter turnout in a presidential election over the past two decades. The last presidential election held in 2012 posted a turnout rate of 75.8 percent, following a 63 percent turnout five years earlier. The high turnout rate in Tuesday’s election may indicate a high public interest in a possible regime change following the massive corruption scandal involving the former president. Also, a record number of more than 11 million or over 26 percent of the total 42.4 million eligible voters cast their ballots over a two-day early voting period held last week.